Is it possible to make films with words? To borrow the terminology put forward by Austin, can cinema in certain instances be performative?1 Can a linguistic utterance take the place of the film itself? I would like to develop this hypothesis in relation to the films of Roland Sabatier, which combine the dematerialisation of the artwork with a certain conceptualism. Roland Sabatier belongs to the Lettrist movement. His early works date from 1963. Together with Maurice Lemaître he was one of the main artists in the group to develop a cinematographic project on a consistent basis. It is difficult to describe his work without evoking the context of the Lettrist avant-garde, which emerged at the end of World War II under the leadership of Isidore Isou, and looked beyond the aesthetic field towards a general revolution of knowledge. Note that Lettrist cinema was analysed and commented upon mainly by Lettrist artists themselves, in keeping with the movement’s characteristic tendency to develop its own historiography, couched in a distinctive critical language, using neologisms, and marked by the publication of manifestos and articles in Lettrist books and journals. While the idea of radical work that pushes at the limits of the medium in sessions of expanded cinema and performances is something we can understand fairly well, the publication of Œuvres de cinéma continues to surprise. Most of the sheets describe films that were never made, performances that did not take place, projects that were never realised, described in the form of simple hypotheses, granting the wish expressed by Édouard Levé: “A book describes works conceived by the author, but that he did not make.”12 The film’s technical data (the script) has become the film. Are we in the presence of a category of paper film? 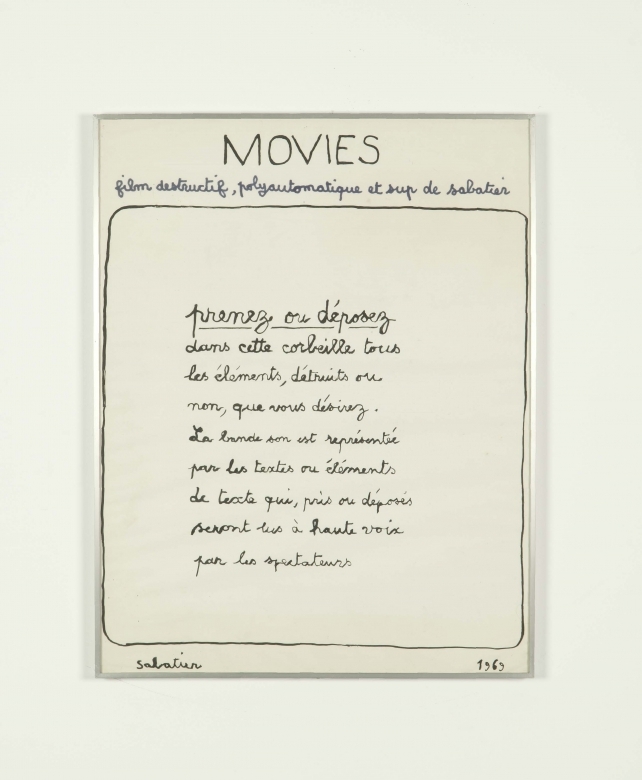 By its artisanal character, its recourse to self-publication, and above all the description of films whose existence rests mainly on their linguistic articulation, the book seems to belong in the sphere of the performative. What is the status of these technical data? Sabatier tends to speak in terms of projects, even if the status of these documents may suggest other terms: score, instruction or injunction, for example. “What people may call them is indifferent to me. I never raised the problem. One could also say score, as a generic term for a project. A synonym for project. How should one say that? A list. One brings together all the elements. A kind of guide.”13 It would seem, however, that the virtual dimension of the films was not totally premeditated or intended. “Wishing to position myself truly within cinema, I conceived these films which are intellectual conceptions. They open onto a few practical considerations, but no one has never proposed that I show them. If I had had to show them, I would have been more interested in the way of presenting them while preserving their anti-cinema characteristics.”14 Failing that, then, he published them. But was the absence of production fortuitous? Could we not interpret the act of publication as a performative? It is striking fact that Sabatier’s cinema often assumes a script (an utterance, a text, a suite with dialogues) as part of its activation. If the film is sometimes reduced to the simple statement of a project, published in the book in the form of a description, some films also invoke a second script that must be activated at a cinema session. Can the technical sheet be interpreted as a performative document? “A performative document is thus a document that is not exhausted in the act of documenting; it transforms the way of being – the ontological status – of what it documents. It turns an ordinary or extraordinary action into an artistic action.”15 This seems to be what the data sheets published by the artists do. We can distinguish three modalities: the data sheet describes a performance based on a second script, following a simple procedure (Hommage à Buñuel, 1970); the technical data describe a performance that is based on a performative script in accordance with modes of presentation that are complex, labile, diversified, and capable of existing in multiple versions (Regarde ma parole qui parle le (du) cinéma, 1982); the data sheet is a simple performative utterance which is accompanied by an editorial strategy (Le film n’est plus qu’un souvenir, 1975). 1. “The author tells the audience what the film will be by giving details about the contents of the sound and image. After a moment of description, he ends by saying: ‘I will therefore not make this film, but imagine what it could have been on the basis of the few indications that I have just given you.’”16 Hommage à Buñuel, “a polythanased hypergraphic film,” was presented by the author at the Cinémathèque Française on 23 April 1970. This simple description implies a second script, read by the author to the public, describing the imaginary work that should have been projected. This was a “hypergraphic film” that combined different écritures and visual signs forming a rebus. “Again as an example, another image shows a portrait of the maker of this film looking spectators in the eye (je)… / Against a black ground, the syllables ‘PEN’ and ‘SE’ (pense [think])… immediately completed by an/Image in line with the tail of a cow (que [that/tail])… / I repeat that this is only an example designed to enable you to grasp the way the film is conceived.”17 The text read by the artist ends with these words: “By now, with regards to the film… you know as much as its maker, and since the latter is not inclined to concretely translate it onto the film, he suggests that you enter with him into the supplementary originality of non-realisation and imagine, as he himself does at certain moments in his life, what this film could have been based on the indications that he has just given in front of you. This film will therefore remain as it is, hanging from the lips of Roland Sabatier, its promoter, forever!” The technical data list describes a performance that is itself performative, which activates the film through its linguistic articulation in accordance with the principles of imaginary or infinitesimal art. 3. A last example: Le film n’est plus qu’un souvenir, dating from 1975, a “polythanased film” of variable duration, without film stock, with various documents and accessories. I quote from the data sheet: “The author steps towards the public and, looking embarrassed, announces that he has made a chiselling film, but that this film has just been destroyed and therefore cannot be screened. In the end he offers to replace this work with the presentation of a certain number of documents bearing witness to its past existence. The new film, which is never named as such, occurs in the allusions to the films it is replacing and is manifested by the confused and awkward exhibition of various elements: tools, studio photos, bits of leftover film stock, etc., not to forget false press cuttings concerning echoes and reviews which, according to him, are related to the absent film or that served to make it.”23 The performance described has never been activated. It exists only in the enunciation by the book Œuvres de cinéma. 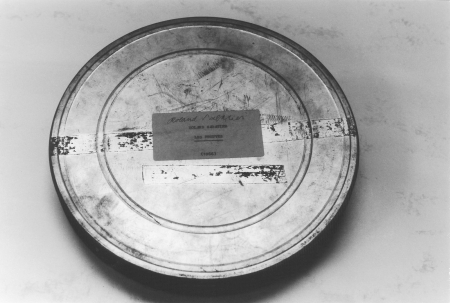 And yet there are documents relating to this film, notably a photograph that is often produced in catalogues, captioned “The film is no more than a memory,” and representing movie accessories (film reel, projector, director’s chair, camera, tripod).24 One might think that it was a photograph of a public exhibition when in fact it is a studio photo taken by the artist in Aubervilliers. For Sabatier, the difference is non-existent. The only thing that matters is the artistic proposition and its date of certification. But is this a performative photograph which makes a work exist by a series of false indices playing the role of triggers of fiction? In this respect, the technical data sheet is a paradoxical performative utterance because the film is forever withheld from any kind of visibility. 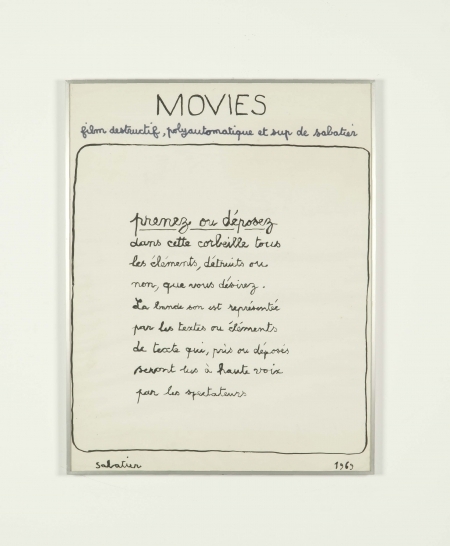 One might wonder about the closeness of Sabatier’s cinema to conceptual art. 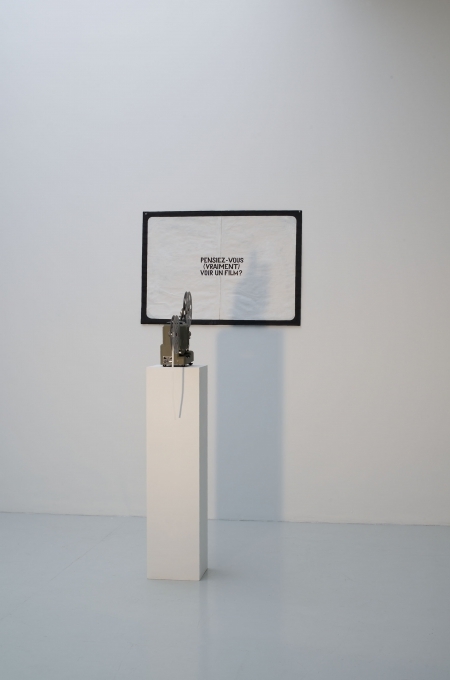 We could certainly mention the use of administrative procedures (the data sheet), the linguistic definition replacing experience (the performative utterance instead of the projection of the film), the critique of reification (the film destroyed), the juridical contract linking the work to its reception (Lettrist certification), and the taking into account of reception by the spectator (the imaginary or infinitesimal dimension). No doubt the performative dimension casts doubt on the nature of the artistic propositions, which are halfway between linguistic utterance and its possible activation. 1 John Langshaw Austin, How To Do Things with Words (1962), Harvard University Press, 1975. 2 Isidore Isou, Esthétique du cinéma , Ion, Paris, repr. J.-P. Rocher Éditeur, 1999. Cf. Frédérique Devaux, Le Cinéma lettriste, Paris, Paris Expérimental, 1992. 3 Maurice Lemaître, Le film est déjà commencé ?, Paris, Éditions André Bonne, 1952. 4 Cf. Isidore Isou, Introduction à l’esthétique imaginaire et autres écrits: Paris, Cahiers de l’Externité, 1999. 5 Pavle Levi, Cinema by Other Means, Oxford University Press, 2012. 8 After ten years of enrolment as a doctoral student, Sabatier decided not to defend his thesis, although he had obtained all the necessary university credits. 10 Cf. Fabrice Flahutez, Le lettrisme historique était une avant-garde, Dijon: Presses du Réel, 2011. 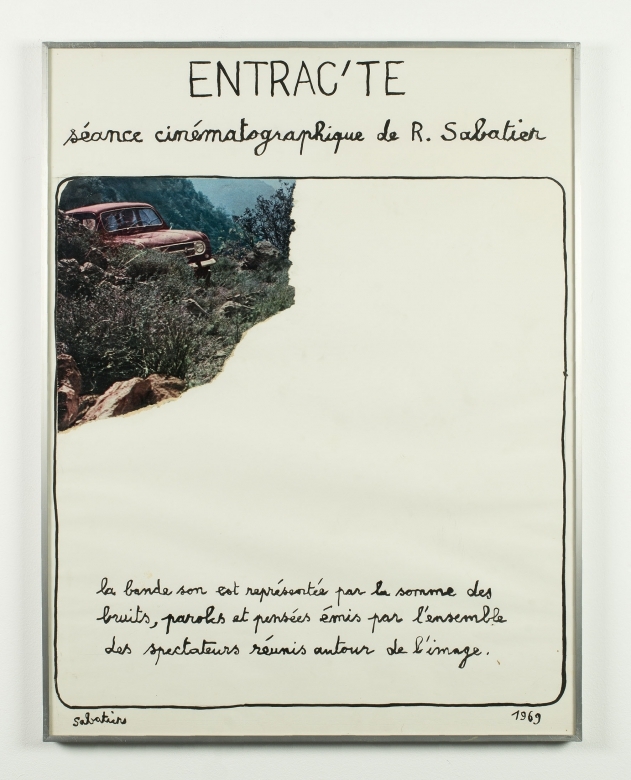 11 Roland Sabatier, “L’anti-cinéma lettriste : le cinéma sans le cinema,” in L’anti-cinéma lettriste 1952-2009, exh. cat., Sordevolo, Zero Gravità, 2009, p. 54. 12 Édouard Levé, Œuvres, Paris: P.O.L, 2002, p. 7. 13 Conversation with the author, Paris, 16 April 2013. 15 Stephen Wright, “Visibilités spécifiques,” Cahiers du post-diplôme, no. 3, Angoulême-Poitiers, École Européenne Supérieure de l’Image, 2013, p. 30. 16 Œuvres de cinéma (1963-1983), op. cit., p. 29. 17 Document provided by the artist. 18 Roland Sabatier, Trois films sur le thème du cinéma. “Regarde ma parole qui parle le (du) cinéma. 1982,” “Quelque part dans le cinéma. 1982,” “Une (certaine) image du cinéma. 1983,” Paris, PSI, 1983, p. 13. 20 Conversation with the author, Paris, 16 April 2013. 21 Trois films sur le thème du cinéma, op. cit., p. 27. 22 Trois films sur le thème du cinéma, op. cit., p.
23 Œuvres de cinéma (1963-1983), op. cit., p. 60. 24 For example, on the cover of the journal Zehar, no. 56, May 2006 or in L’Anti-cinéma lettriste, op. cit., p. 96-97. Other elements from this set of objects were exhibited in a display case when he had a solo show at the Galerie Artcade, Nice, from 17 September to 20 October 1992. 24 J. L. Austin, How To Do Things with Words, op. cit. p. 14. 25 J. L. Austin, How To Do Things with Words, op. cit. p. 14. 26 Conversation with the author, Paris, 16 April 2013. 28 Pierre Bourdieu, Ce que parler veut dire, Paris: Fayard, 1982. 29 “L’anti-cinéma lettriste : le cinéma sans le cinema,” op. cit., p. 58. This exhibition is part of Art Brussels' programme. En dehors d’un certain nombre de films encore inscrits sur la pellicule, comme Le Songe d’une nudité (1968), Évoluons (encore un peu) dans le cinéma et la création (1972), Pour-Venise-Quoi ? (1994), ou encore Propriétés d’une approche (2008), la plupart de mes réalisations renoncent aux supports filmiques traditionnels pour se présenter comme des films parfois sonores, souvent sans image et, plus fréquemment encore, comme des réalisations destinées, non plus à être projetées dans la pénombre, mais à être exposées en pleine lumière. De ce point de vue, toutes les œuvres filmiques choisies par Éric Fabre pour figurer dans Anti-cinéma (lettriste) & Cinémas lointains (1964-1985) sont représentatives de cette démarche purificatrice explorée jusque dans ses conséquences les plus extrêmes vers les limites au-delà desquelles un film ne ressemble plus à un film. Rejoignant la modernité atteinte avant lui par la peinture, la poésie, la musique ou le roman, ce mode cinématographique finit par ne plus être qu’une réflexion sur le cinéma avant de s’achever dans la moquerie grossière de ce que ce dernier avait été autrefois. Comme dans un musée, « il se fait du simple déballage des éléments qui, autrefois, servaient à faire le cinéma». Ainsi, dans le but de se jouer du cinéma, l’auteur « redevient l’enfant qui joue au cinéma et devient l’ancien cinéaste qui regarde nostalgiquement son passé et celui de son art ». Comme expressions de l’achèvement et de l’anéantissement du cinéma ciselant, hypergraphique, infinitésimal et supertemporel, ces œuvres s’imposent comme des entités autonomes. Comme telles, elles existent déjà dès l’instant où elles sont (dé-) écrites et publiées. Leur matérialisation éventuelle, secondaire — possible ou non —, peut dès lors être entreprise de différentes manières selon le lieu et le contexte où elles seront portées à la connaissance du public : salle de cinéma, d’exposition, distribution dans la rue ou autres. Ces mises en œuvre potentielles n’apportant que des enrichissements secondaires, propres aux mécaniques ou cadres ponctuellement sélectionnés pour des circonstances données, sans altérer ni modifier la substance formelle intrinsèque des faits esthétiques. Cette disposition justifiant la réalisation pour chacun de ces films d’un certain nombre de variantes ou de modifications qui ne sont que des adaptations possibles de leurs fondements premiers, seuls essentiels.